There he (or she?) is at the top of our house. Running away as I stepped from the van, watched as it ran up to the house and sat. No zoom on the cellphone camera I have now....drives me nuts!!!! Have not created any new art lately but don't believe I have shared this portrait that BigBoy did a couple of years ago. Biscuit, a golden retriever we had for years until he passed a few years ago. Have a great Wednesday! Gorgeous job on the dog! The shading is awesome! I'm glad you brought it back as I had not seen it before. 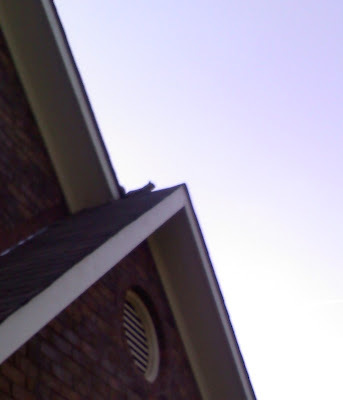 Is that a gray squirrel up on your roof? We have 6 ever day eating up all the bird food. Its driving me crazy. I want to see the migrating birds and they are keeping them away.. grrr. Cute tho. Big Boy is one awesome Artist. Runs in the family I see. Squirrels are such pests. The drawing is very good. I love this dog drawing! I should really draw my dog Ginger too, but i ONLY ever take millions of photos of her! Wow, your son is very talented! I hope he's persuing this.